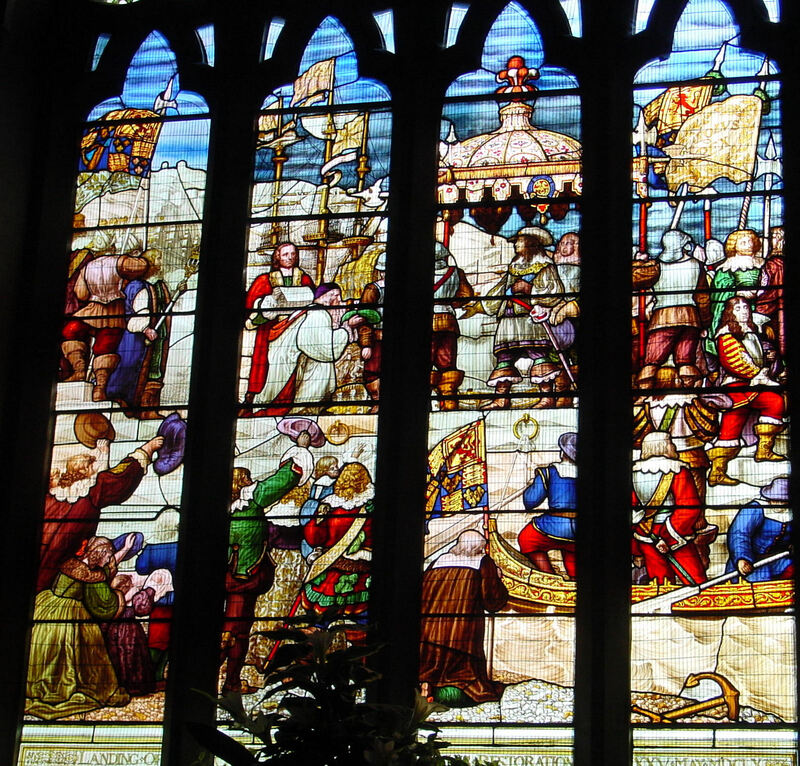 Charles II landing at Dover 25 May 1660 – Maison Dieu window. In 1660, Charles II stepped ashore on Dover beach to claim the throne of England. The country, in the preceeding twenty years had been through three Civil Wars and witnessed the beheading of the Monarch – Charles I on 30 January 1649. Dover’s Member of Parliament, John Dixwell, was one of those who sanctioned the regicide. The country became a republic or Protectorate controlled by Oliver Cromwell and a Council of State. Following the death of Oliver Cromwell on 3 September 1658, his son was appointed to succeed him. However, a power struggle ensued and General Monck, commander of the Cromwellian forces in Scotland marched south and entered London unopposed. On 21 February 1660, he dissolved the Rump Parliament (1648-1660), established following Pride’s Purge of 6 December 1648, and re-established the Long Parliament. The Long Parliament dissolved itself on 16 March 1660 and in response, on 4 April, the exiled Charles II issued the Declaration of Breda. In this, he made declarations that he promised to uphold if he was restored to the throne. The predominantly Royalist Convention Parliament met on 25 April and declared that Charles II had been the lawful monarch since the death of his father in 1649 and preparations for the Restoration began immediately. On 14 May, Sir Edward Montagu, the Admiral of the Fleet, asked the captains if they would object to bringing Charles II back to England. Dovorian, William Stokes, as the Captain of the Naseby, replied, “it was his job to stay at his command”. Captain Stokes was a Parliamentarian who later became one of Dover’s most esteemed Mayors as well as Member of Parliament. Charles II left The Hague on 23 May on the Naseby, which he renamed the Charles, with William in command. Two days later, on Saturday 25 May, at about 1pm, Charles II set foot on Dover beach. In his Majesty’s party were James, Duke of York (later James II) and General Monck as well as other nobles and dignitaries. A stained glass window in the Maison Dieu commemorates the historic landing. Of interest, this was presented in memory of George Thompson, who was the Dover coroner and captain in the Dover Artillery Volunteers, when he was killed by the bursting of a gun during target practice at Archcliffe Fort in 1860. Although it is not stated on the window, George Thompson was also the Dover Harbour Commissioners’ (later Dover Harbour Board) Register. 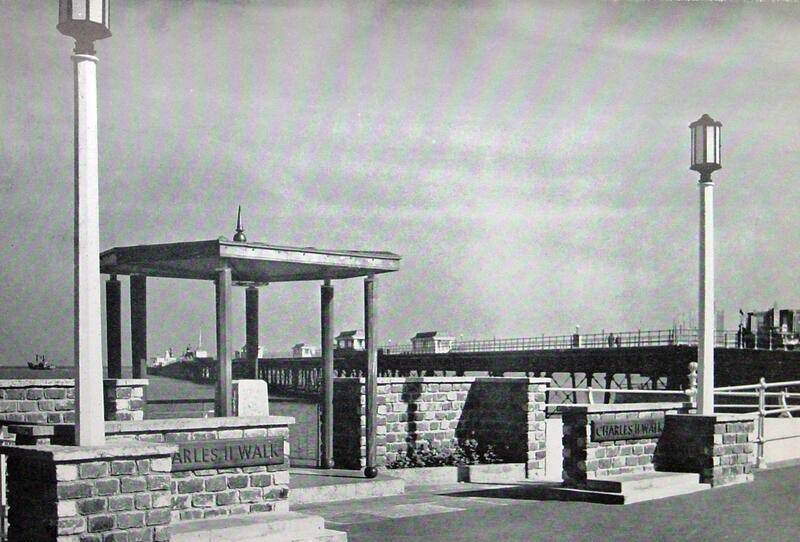 To commemorate the tertiary centenary of the Restoration in 1960, Dover Harbour Board built the Charles II Walk. This was designed to pass the actual spot where Charles II landed and it ran from the Esplanade, in the east, under the Prince of Wales Pier to the North Pier and opened up, to the townsfolk, a little known part of the harbour. 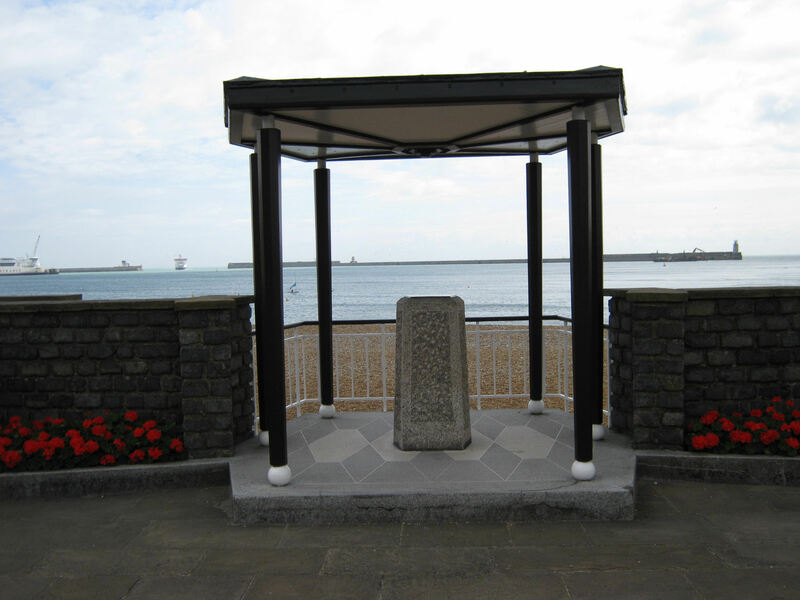 Henry Hawksfield, Chairman of the Dover Harbour Board, invited Lord Cornwallis, Lord Lieutenant of Kent, to open the Walk. After inspecting a guard of honour mounted by ‘D’ Company 5th Battalion, The Buffs, T.A. commanded by Dovorian, Capt. Graham P. Turner; he unveiled the Charles II Memorial at the east end of the Walk. In his speech, Lord Cornwallis recalled, “The moment we are commemorating today was not just a landing of an exiled king, it was the beginning of government by Parliament under the Crown.” Among the many distinguished guests was the Mayor of Dover, Alderman Mrs Dorothy Bushell, Dover’s first female Mayor. However, much of the Walk was sacrificed when, in 1978, the now defunct Hoverport was built. This included the cutting down the Grade II Listed ironwork of the Prince of Wales Pier, under which the Walk passed. The Memorial was repaired in 2011 but for many of us it would have been even better if at least part of the Walk had been reinstated. This entry was posted in Charles II - Restoration, Charles II - Restoration, Civil Wars and Interregnum, Royalty. Bookmark the permalink.